As you may or may not be aware, I recently opened up about the assault that took place three years ago, and more importantly, the post-traumatic stress disorder that I was diagnosed with months after the incident. PTSD, like all mental illnesses, is one constant uphill battle. In my experience, there is no real escape from mental illness. There is no real end. Similar to the likes of fighting addiction, it's something you grapple with constantly and must always be vigilant about. Whilst there are days, and sometimes weeks and months, where I succumb to the demons in my head and my life just about halts in its tracks, there are days, and sometimes weeks and months, where I feel like a regular person where demons aren't clawing at my soul; where I'm not reliving the sheer panic and fear of being attacked; where paranoia's icy cold grip isn't squeezing tightly around my heart. Unfortunately, I am not confined to just one mental illness. My anxiety is a by-product of my PTSD, and I've been battling with depression since just before my 17th birthday. I've been fascinated by scrolling through the Inside Out Challenge responses on Instagram (if you didn't know, it was started by Yasaman Gheidi, a beauty YouTuber who goes by @lilmoonchildd on Instagram) and as such, have wanted to tackle this challenge for myself. It's a hard challenge to do, however, because there is so much to take into consideration. I can use words to describe how I feel, but to convey this into not even just a picture, but make-up artistry? That's a whole other matter. 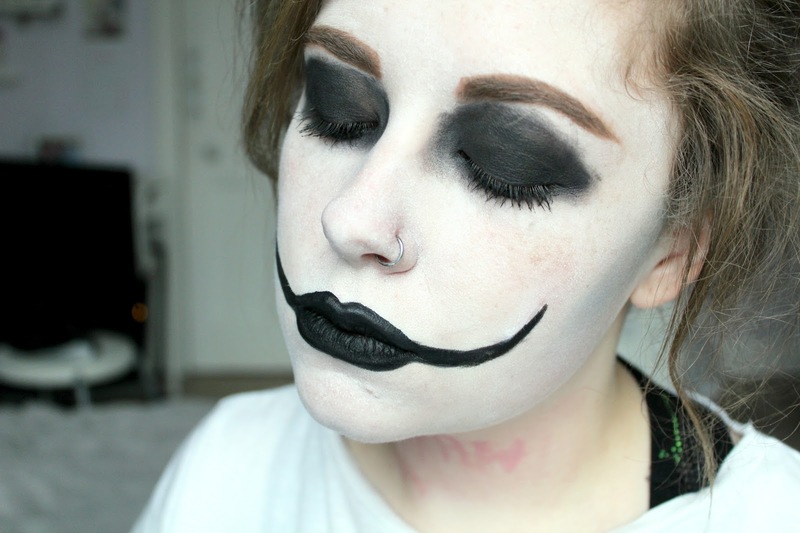 I still want to create a look for depression, but found it particularly hard to come up with how to portray it. I actually have an idea now, as I type this, but I did this look for PTSD back in around February time. Today I thought I'd share it with you and talk about what I did and why I chose to portray my PTSD in this way. The basic idea of the challenge is to show you feel on the inside, on the outside, and by doing so you help to break the stigma of mental health and to raise awareness of the challenges those who suffer from mental illness face on a daily basis. It is mostly done by people painting one half of their face with how they feel inside, and by doing a regular beauty look on the other side, obviously showing how they look on a day-to-day basis, and showing the significance of how important it is to not judge or make assumptions. I decided to paint my whole face. Why? Because PTSD has consumed so much of my life. Mental illness as a whole, not just PTSD, has taken so much time from me. Time where I should be living, creating memories and art, have instead been spent lying in bed watching Netflix shows I'm not that interested in and falling asleep every couple of hours. Mental illness has taken time from me that I wish I could say I spent productively. It has taken moments I should be sharing with my best friends, and days where I could be cherishing time with my partner. I used a white base to paint my skin - I was too lazy for face paint, so opted for a white cream from the Freedom Ghost Stories palette, hence why it looks a tad patchy in places - and give myself an all-over ghostly appearance. The fact is, there are times where my PTSD's grip becomes so tight around me that I feel like a shell, a ghost of who I am. Whilst I have changed, grown and developed over years, there are fundamental parts of my personality that have remained the same throughout my lifetime. PTSD, however, makes me feel like a different person. A more fearful, paranoid person. I don't give myself too much of a hard time over this, but there are times where I have a strong dislike for this ghostly self, and I find it hard to compute that were are one in the same person. On a similar note, I painted my eyes black to give an exhausted, zombie-like, hollowed out effect. This idea came from much the same way in that I feel like a shell or ghost of who I am, and the fact that I have spent so many days in a haze, tired and lonely, not really seeing the world, only feeling the effects of post-traumatic stress. 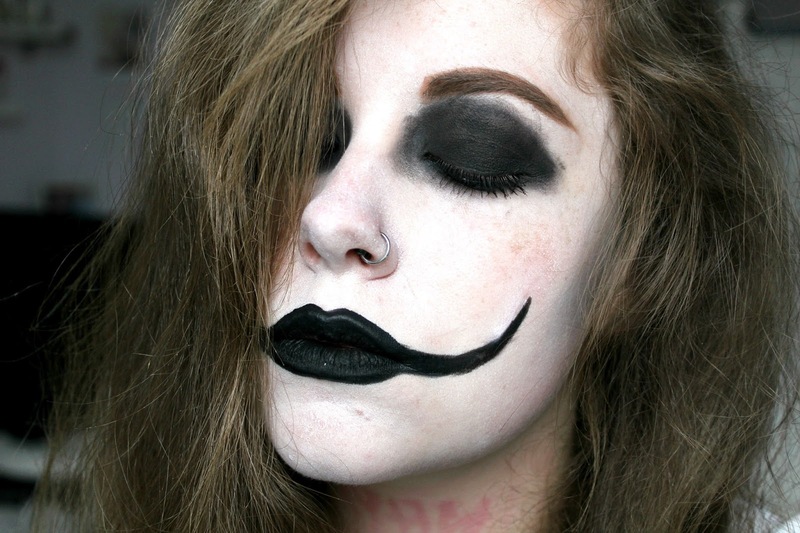 For my lips, I added this Joker-like, twisted, demented smile. Mental illness is often associated with the demons in ones head and heart, and I often picture my own with this kind of malicious, masochistic grin, like my pain and fear is a laughing matter, and that it's a pleasure to see me tormented by the paranoia and the insecurity that I often experience. Lastly, I added a blue, shadowy contour to my face (I own next to no blue eyeshadows so it was a struggle to find one!) as a representation of the icy, cold blankness you can feel when you are emotionally numb. This is often something I experience more with my depression, but there has been times where I've felt this way with PTSD too. I did attempt to recreate an open wound look on my neck where it would like the word 'why?' was carved into my skin, but I couldn't quite get the depth that I needed to make it look realistic, and it was a lot of hard work to get the red off afterwards, hence why it's still lingering. The question of why this happened to me, and why it happened in the first place at all, and why certain people did certain actions are all things that went around in my head a lot when the incident first occurred. I now don't have this problem the same way - I accept what happened, and I deal with it, rather than drive myself crazy with the answers to questions I'll never know. But this was an important question to me in the initial aftermath, and the fact that I'd never have answers was something I struggled a lot to get to grips with. Have you tried the Inside Out Challenge? I'd quite like to do a version for my depression at some point as I have a vague idea of how I'd like to represent it, but I probably wouldn't do it for another while. If you suffer from mental illness, I highly recommed setting yourself the challenge of creating a make-up look for your illness - not only does it encourage conversation and seek to end the stigma against mental health problems, but it's also a fun way to be creative and experimental, and it's satisfying to see your look at the end. Let me know if you plan on taking the challenge for yourself, and check out my post on PTSD here if you haven't already seen it.